There is only one store in the greater Los Angeles that has this essential ingredient in both the Baltimore Eggnog and the Sangaree Punch. Wally’s Wine & Spirits had a case of it in the back and none on the shelves. It is, of course, a bit pricier there at $25.99 per bottle, but I took four of them. That means there are still eight up for grabs. You may have to ask for it, since there seemed to be no place for it on the shelves. Today’s drink of the day is one of my own — the Jewel Box Cocktail. I made this for Elemental Mixology Alumna and friend, Anne-Louise Marquis — and all of the good folks she brought to the NipJoint for a private class a few days ago. The Jewel Box Cocktail didn’t take much thought or work. I took the 1890’s Bijou Cocktail from the Waldorf Hotel as a starting point. That one was based on Grand Marnier Cordon Rouge (an orange-flavored brandy liqueur) and is modified by an equal part of dry vermouth wine. I maintained the proportion between those two ingredients, but scaled them down to make them both work as modifiers to Pisco brandy — actually Kappa Chilean brandy, in this case. 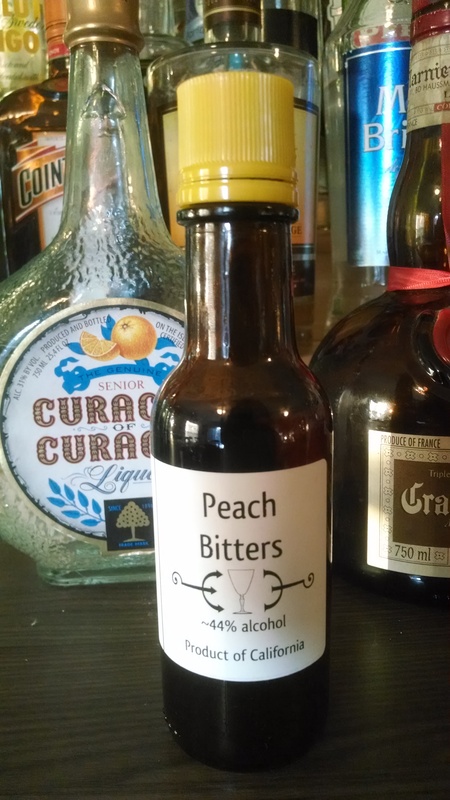 Today, I put up the last batch of peach bitters that will be finished by attendees of an Ingredient Fabrication Course in Elemental Mixology’s Los Angeles location. 4 ounces of dried peach kernels and 2 ounces of dried cinchona bark were placed in each jar. 192-proof rectified spirit was added to the one on the left and 80-proof French brandywine was added to the one on the right. 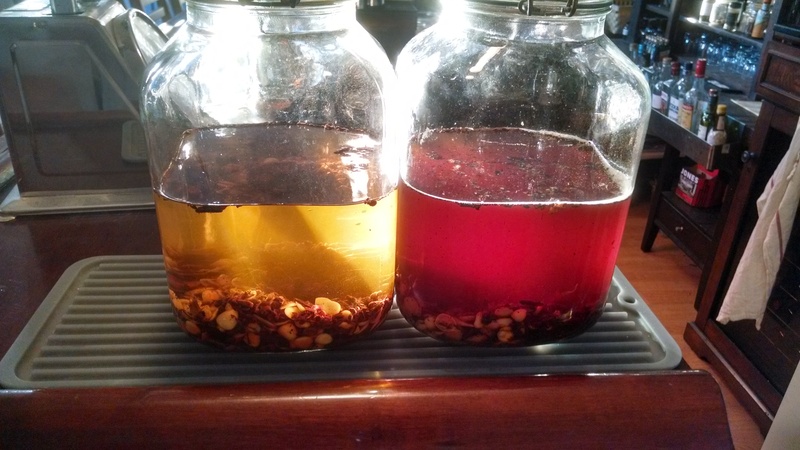 The students will filter, blend and add other ingredients next week to finish the peach bitters. Elemental Mixology Alumna Robin Jackson – L.A. Weekly’s Best Bartender! It only just came to my attention that back in October, L.A. Weekly magazine chose Robin Jackson, an Elemental Mixology alumna (of an early 2014 Standard Mixing Course), as Los Angeles’ best bartender. Everyone should go into Oldfield’s Liquor Room over in West Los Angeles and have Robin make you something good to drink!